You always want to be up to date about the latest weather developments. The gadget you have been using is usually hidden, so you have to keep bringing it to the foreground. If you aren’t content with the partly hidden weather gadget in the Windows sidebar, you can try out the free tool WeatherBar that integrates quick information on weather in the taskbar. The tool is available from the website weatherbar.codeplex.com. To configure it, click below on the gear icon. Then change the ‘Update interval’ to the minimum, e.g. to ‘10’ minutes and change the format to ‘Metric’ to view the temperature values in degrees Celsius. Confirm with ‘OK’. Click the pen icon near ‘Location’. There, enter the name of your city and again confirm with ‘OK’. If you can’t find your city in the list, select the nearest big city. You will now see all weather data and forecasts. 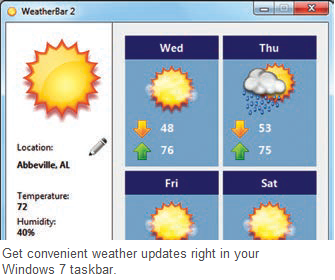 To avoid manual start-up each time, you can attach the WeatherBar to the taskbar for permanent availability. But that causes an error: only the storm icon appears continuously. To avoid the error, execute the program via the autorun (Startup) folder.